Here are some tips on making compost simple. Everyone knows that the success of any pottery plants is the foundation or soil used in the pots. You can purchase high quality potting soil or you can follow some of these easy tips and create your own. 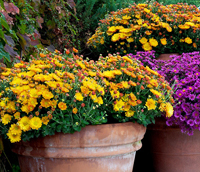 When it comes to successful potted flowers and plants, the soil mix is not the place to skimp. 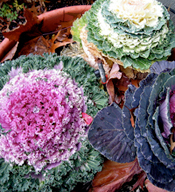 No frugal gardener would turn down the gift of plant food. But that is what we do every time we place a bag of yard trimmings at the curb. Save the cost of store bought fertilizers by turning garden debris into nutrient packed compost. This is a vital ingredient to successful potted plants and flowers. The first step is to chop garden clippings by running over them with a mower that has a bag attachment. Layer or mix green fresh and brown dry materials. Moisten materials as you add them to make the contents damp, but not soggy. Once a week blend outer ingredients into the hotter center. The best compost recipe includes a combo of carbon rich brown materials like dry leaves, plant stalks, pine needles and small twigs with nutrient green materials like coffee grounds, tea bags, eggshells and veggie scraps. Carbon is the spark that starts the composting process. Nitrogen fuels the microorganisms that decompose materials. Try to add about 3 times as many brown materials as green materials. Do not compost meat, bones, animal waste, dairy products, diseased plants, seeded weeds, plants treated with pesticides or any inorganic materials. Keep adding kitchen scraps during the winter months. They will decompose when the weather warms again. 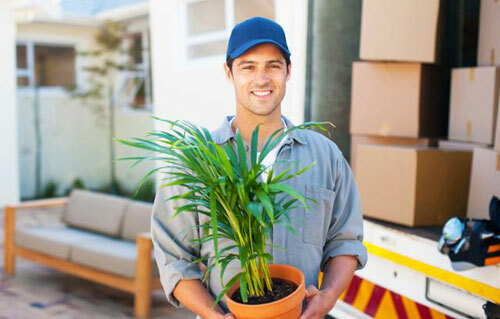 Getting ready to make a move and are a bit concerned about your potted houseplants surviving the journey? Here are a few tips to help. Be sure to wrap heavy plastic or cloth around your potted plants to prevent leafy branches from drying out. 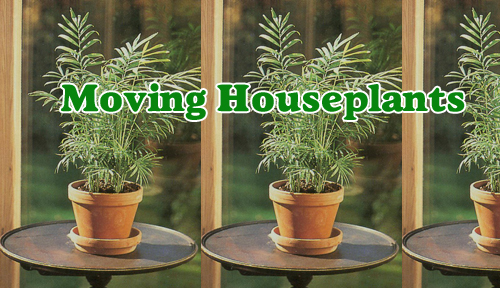 Poorly packed potted plants tip over and bounce around, which can damage branches and break leaves off. Cold and heat can damage them also. During the winter, warm up your car and wrap the potted plants before taking them outside. Never leave them in a cold car while you do additional packing. 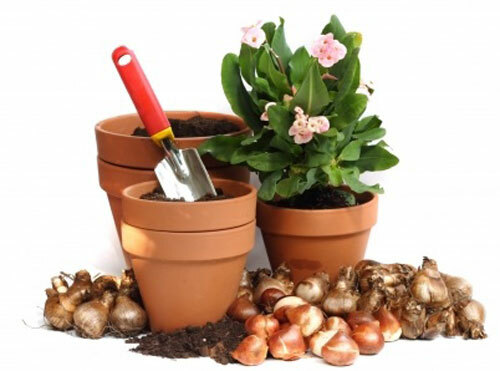 In the summer, make sure the potting soil is moist and don't leave them in a hot car while you unpack other items. If you wrap the potted plants make sure to use a permanent marker to make the outside of the package. Mark what type of plant it is and where it should be placed in the new location. 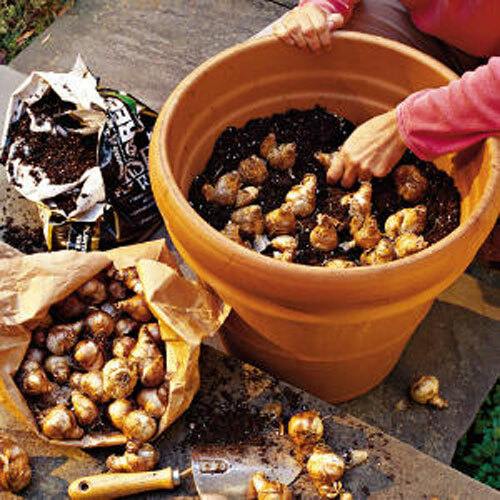 Write the name on the bottom of the pot if necessary so you can remember how to care properly for it. 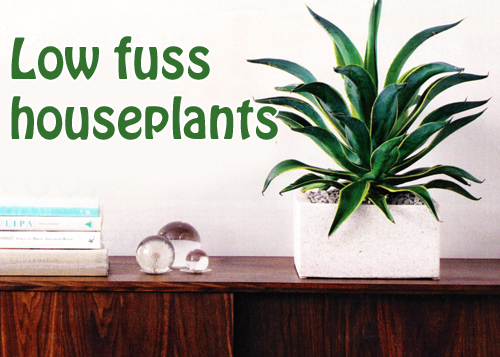 If you are going to be away from your plants for any length of time then make sure you have someone who can come into your home and take care of them. If that is not possible. Place 2 bamboo stakes on each side of the potted plant. Drape a clear plastic bag over the plant and this will create humidity to help the plant survive till you return. Another good tip is to lay plastic in the bathtub. Cover the plastic with newspaper and then wet the papers. Thoroughly water your plants, then set them in the tub and cover with plastic to keep the humidity high. The intense red flower of the potted pelargoniums, verbena and nasturtiums are emplasized by a few yellow nasturtiums and the variegated ivy, but cooled slightly by the soothing blue green of the nasturtiums umbrealla shaped leaves. 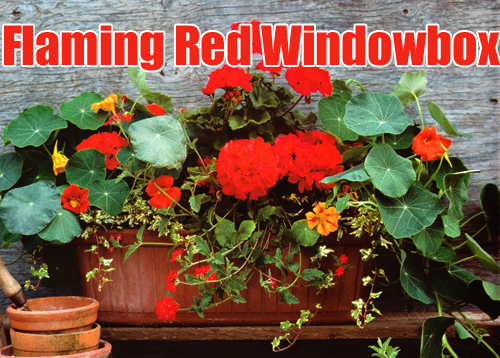 Since nasturtiums are prone to attack by blackfly, treat at the first site of infestation with a suitable insecticide and the plants will remain healthy. Plant in late spring or early summer for greatest success. 1. 20" terracotta clay windowbox garden planter. 3. slow release plant food. Read more.....A golden holiday topiary. 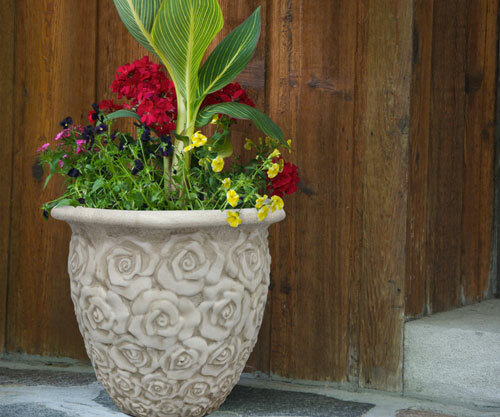 Potted containers are a decorative and mobile addition to any garden or patio. Their value is not limited to situations where there are no flower beds. Nor are they necessarily best grouped in the vicinity of a home but they can play an equally important role in the more distant parts of a larger garden setting. The versatility of garden containers really proves itself in the garden in fact. Their role can be structural, or architectural, or equally that of a furnishing to the garden. 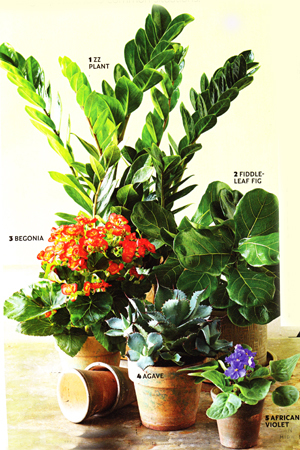 Pots may be used to provide seasonal bright spots of color to be seen, against a mainly evergreen shrub border. 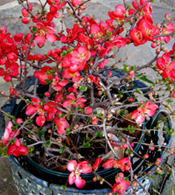 They can be of value during the winter months, when many gardens are void of color. Imaginatively planted window boxes or wall hung planters can add an decorative touch and brighten a blank wall, while pergolas offer endless possibilities for hanging baskets. 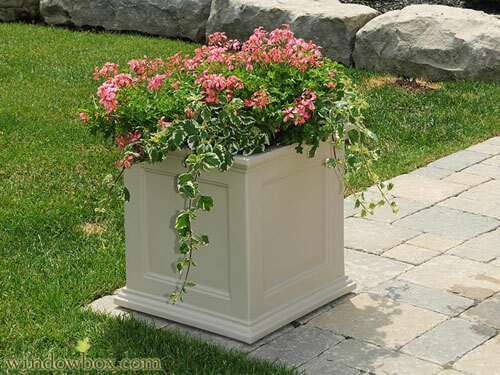 A group of planted containers bring a softening touch to the hard edge of paved areas like a patio or driveway. A single large pot can provide a focal point and can be useful for bringing a dull corner back to life. Larger planters can be used to divide up a garden visually or great separate areas for dining or entertaining. Pots can also be placed on a edge of a path to keep people from stepping off. Swimming pools are hard to blend in with a garden areas and since there is little ground to plant into around the pool, using potted plants and flowers can really add a lot of color and beauty to the area. 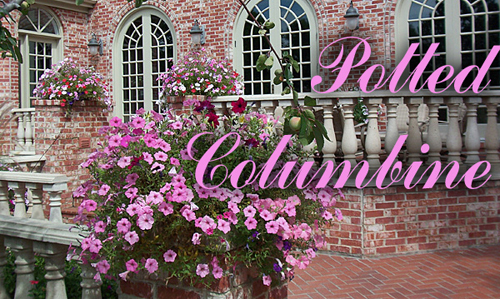 In a formal garden planted urns can be valuable by adding a centerpiece of beauty. Gardening in containers allows the gardener to use the right type of soil for plant that may otherwise not grow in your garden setting. A few short hours is all you need to make your own elegant potted topiary. So grab a pair of pruning shears and get started! Buying an elaborately shaped topiary can be expensive, but a simple shape, such as a spiraling corkscrew, may be easier than you think to make at home yourself. 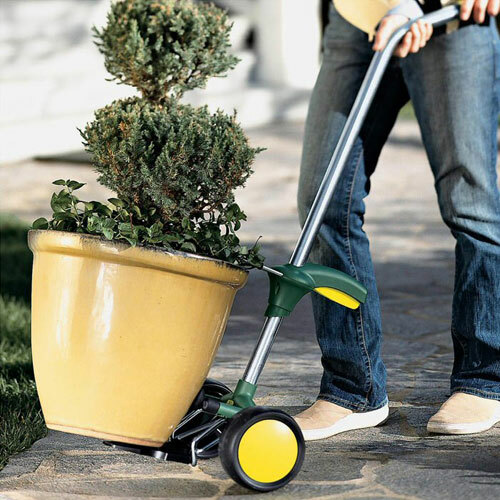 Unlike the case with garden grown shrubs, which are pruned to encourage new growth, the goal when pruning container plants is to keep the bushes looking shapely and neat. Spring is the best time of year to prune or trim an evergreen into a topiary shape. The plants are growing so fast in that season that any slips with the shears will fade as the brush quickly fills out. Wind a piece of string around a conical potted shrub. Tie the string at the very tip of the plant and adjust its position until you are happy with the shape. With shears, trim back foliage above the string to a point about halfway between the lines. Cut as deep as you can leaving the stem exposed. Remove the string. 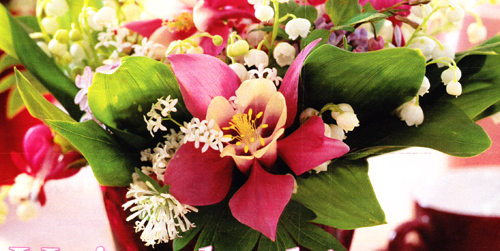 Finish by cutting away any new shoots protruding from the remaining foliage and round off the edges. Trim as needed. Remember to select a garden planter that is large enough to accomodate the root system for the next few seasons without becoming root bound. 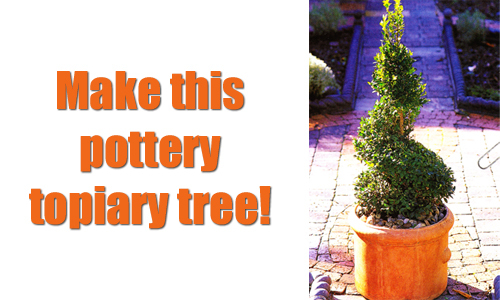 This terracotta planter is a lovely compliment to the topiary. Read more.....Cold & Warm season veggies to pot. Garden herbs are easy to grow outside and indoors. Now that winter is here move them indoors so that you have fresh herbs all season long. Hardy describes most potted herbs. If you give them the right light, temperature and watering you will have their bright and bold flavors at your fingertips all winter long. Make sure the potted herbs get at least four to six hours a day of bright sunlight. A south or east facing window is a must. Give the soil a good soaking after planting, then water thoroughly only when the soil is dry to the touch. Depending on the herbs you potted and the container, this could be as often as daily or as spaced out as once a week. To keep the potted herbs lush and green, feed ever other week with a liquid fertilizer. Watch for spider mites and aphids. At first sign spray with a homemade solution of two drops dish soap per quart of water. While potted herbs grown outside can handle poor soil, this is not true for plants growing inside. 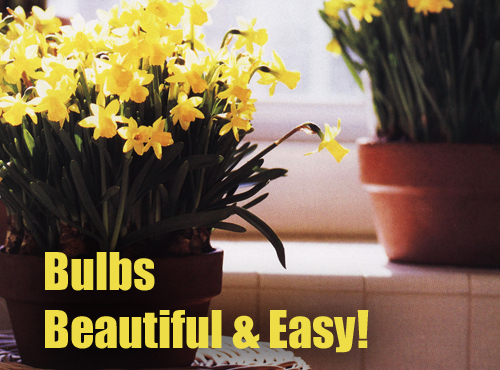 Plant them in the best potting soil mix you can find and afford. Take your herb garden outdoors, at the end of the season and re-pot in larger containers. 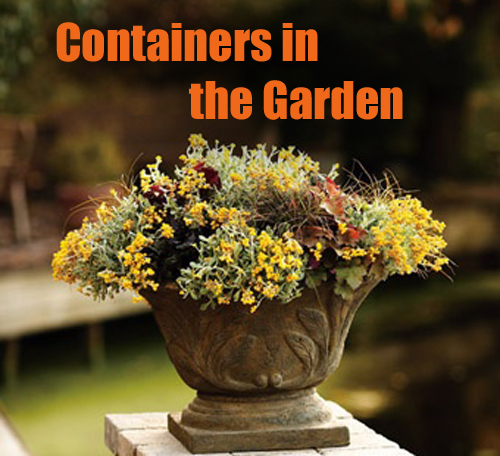 Read more.....Create this container for your home or garden. Love the pots! They are exactly what I am looking for! How can I purchase them? African violet's leaves are borne in a tight rosette, fanning out from a central stem like spokes in a wheel. 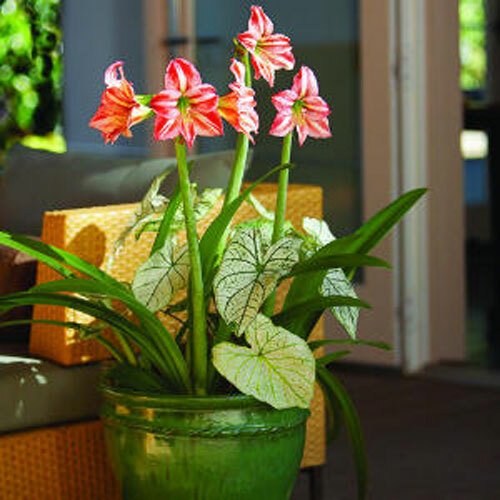 When a potted plant is young and grown in adequate light, this stem is not noticeable. When a plant has grown from low light exposure or has grown for a few years, the stem shows itself and the plant becomes top heavy. Also, some of the lower leaves may die and fall off, robbing the planter pot of some of its elegance. Here are two solutions to this problem. 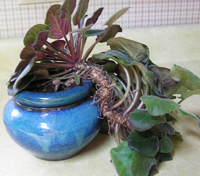 REPOTTING: If the exposed stem is about an inch , the simplest approach is to remove any damaged lower leaves and repot the African violet so that the stem is buried in the potting soil and the existing leaves again are flush with the top of the pot. New roots will form on this buried stem. 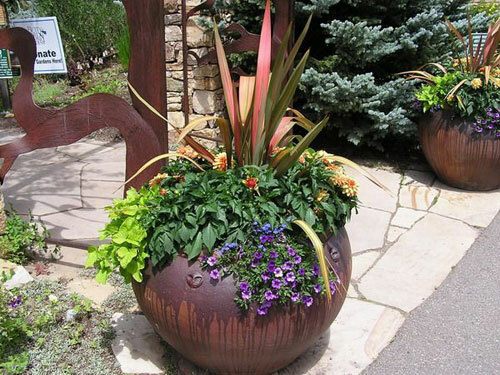 Now is the time to step up to a bit larger planter in size and a different color or type of planter for design. 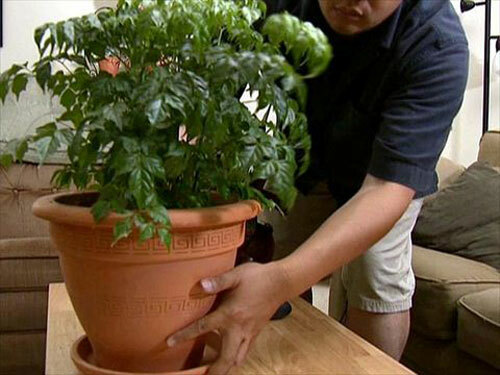 REROOTING: If the exposed stem of the potted plant is a few inches high, cut the entire top portion off. Remove about one-third of the lower leaves, dip this cutting in rooting hormone and place it in a container of damp potting soil. 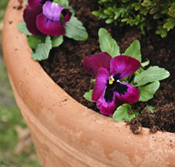 Cover the pot with a clear plastic bag, with stakes in the pot to keep the bag from touching the violets leaves. Place the pot in diffused light, rather than direct sunlight. Try to keep the humidity in the bag and then give it about 6 weeks to re-root. 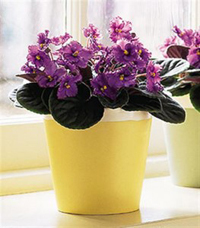 Then remove the bag and you will have a rejuvenated African Violet, beautifully potted and ready to display. 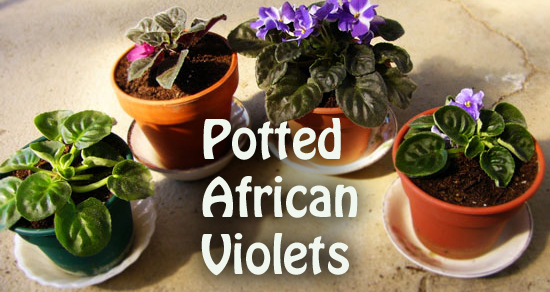 African Violets are a popular houseplant choice. Some people think they are hard to manage but they really aren't. Did you know lack of sunlight is the most common reason they fail to flower? Make sure it's indirect and not direct. Water from the top using water warmed to room temp and take care not to wet the leaves. When the soil is dry to the touch, water until the water comes out the pots drain holes. Let it drain for 20 minutes and then empty the saucer. 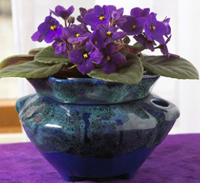 With a bit of special attention African violets will be a rewarding house plant.